If you’re looking for a simple, yet stunning dish to serve at your holiday table this year then look no further than these roasted butternut squash rounds! They’re covered in an insanely delicious, winter parsley pesto because pesto is life. In case that’s not enough they’re also sprinkled with little bits of walnuts for good measure because we’re all about that crunch factor. Unlike a lot of roasted butternut squash dishes there’s no need peel the skin here. As long as you slice the squash into thin enough pieces it will cook and soften just fine and it’s not a problem to eat. That being said I know some people aren’t crazy about eating the peel so feel free to go ahead and peel if you feel more comfortable. Altogether this is a pretty simple and straightforward dish. Though the total cook time runs about an hour the hands on prep time is really only about 10-15 minutes. Slicing up the squash will take the most amount of time but with a good, sharp knife it’s an easy enough task. The pesto whizzes together in a couple of minutes before it’s ready to go. The most difficult part there will be trying not to eat too much before it’s time to spread it over the squash. 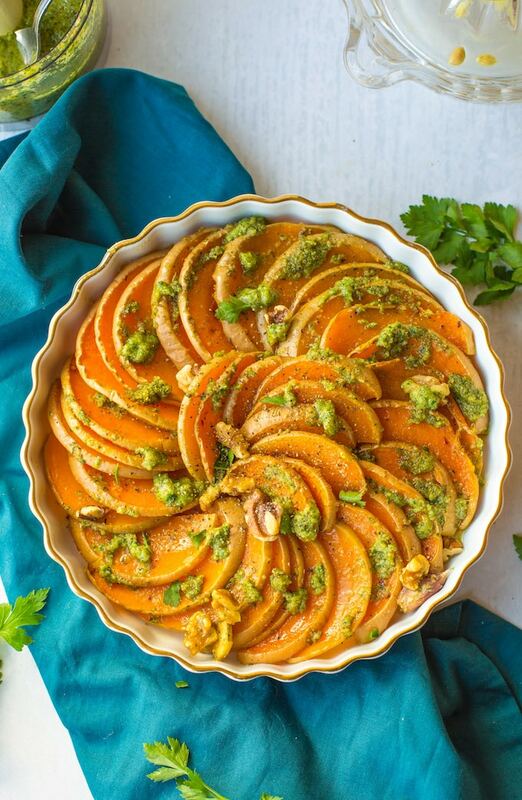 If you’re planning on making this for your Thanksgiving/Christmas menu you can cut down on your prep time on the day of by cutting up the squash a day or two ahead of time and making the parsley up to a week in advance. And there you have it – simple, stunning, and so very satisfying! 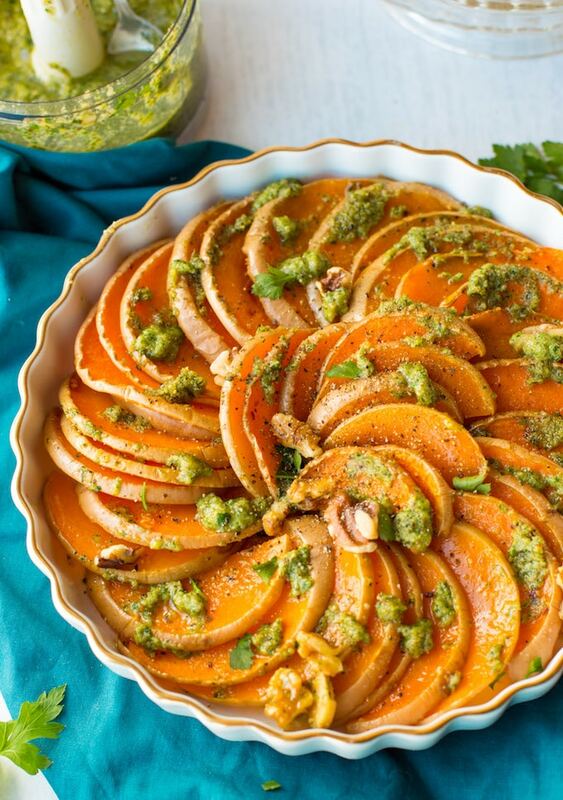 Don’t forget to tag @asaucykitchen if you try these Roasted Butternut Squash Slices! You can also post your pictures to my facebook page! Preheat oven to 400°F/205°C. Add 1 tablespoon olive oil to a 2 quart roasting dish/pie plate. Place your squash on its side and use a good, sharp knife to cut off both of its ends. Then continue cutting the squash into thin slices, about 1/4 inch thick. Arrange the butternut squash in your roasting dish and brush the remaining 2 tablespoons oil over the top and around the slices. Sprinkle with salt and pepper and then roast in the oven for 30-35 minutes. 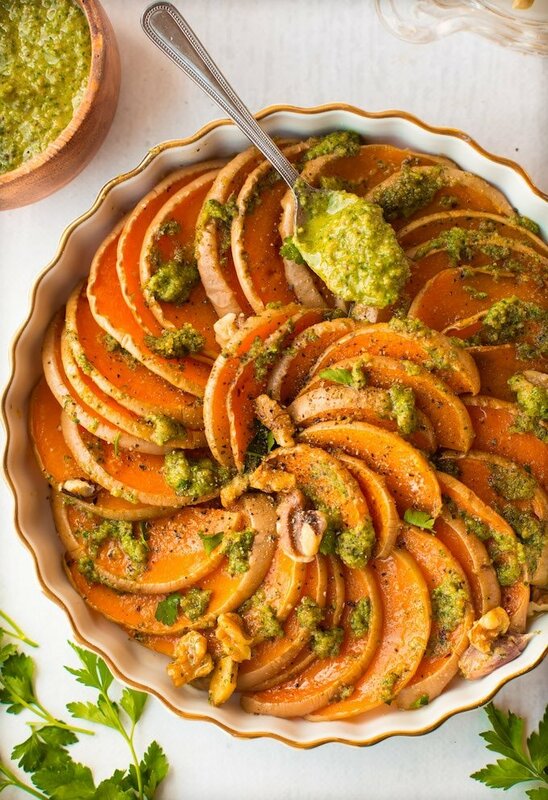 Take the squash out of the oven and sprinkle with chopped walnuts and half of your parsley pesto. Return to the oven and roast for another 15-20 minutes or until the squash is fork tender. If you cut your squash into thicker pieces you'll need to leave it in the oven for longer. Serve immediately with the remaining pesto on the side and enjoy. Add all of your ingredients needed for the pesto to a food processor or blender and blitz until your reach your preferred pesto consistency. Add a little more olive oil if you like it more loose. Taste and season as needed. I don't peel my squash in this recipe but feel free to peel away if you'd prefer. If you do choose to peel it you can also save the skins and add it to your next homemade stock. Any leftover pesto can be kept in the fridge for up to a week. 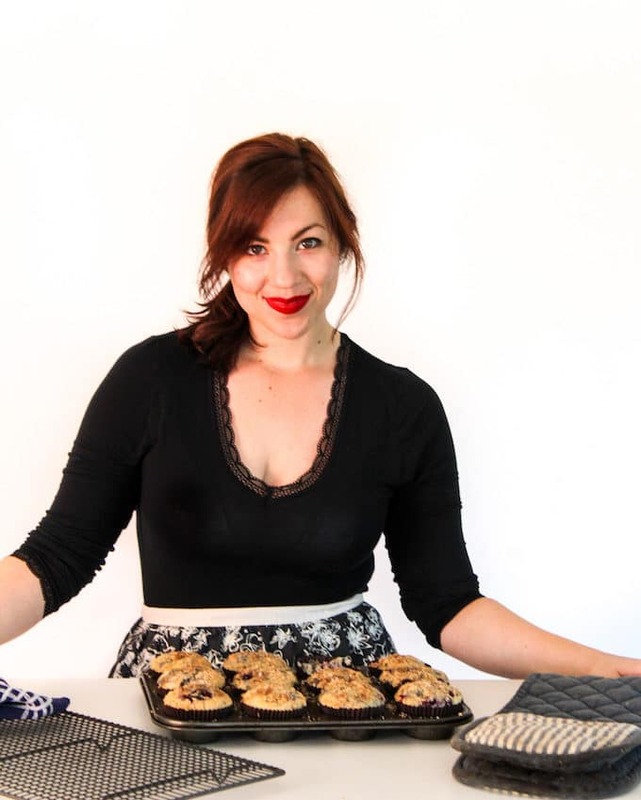 Dear Sarah, I have just made this recipe as right now it is the pumkin season in our area. This tian tastes so good!! I did the pesto without garlic because need to go to work in the afternoon. But even without garlic, the result was magnificient. I also added feta cheese on top, which gave the dish some more calories. In fact, it became the main dish for lunch today. Both my husband and myself liked it so much!! 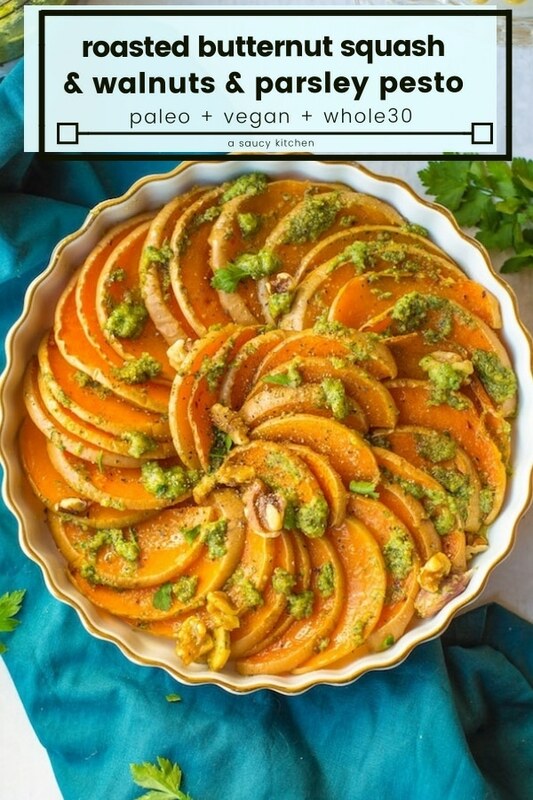 I found your blog while searching for butternut squash tian recipes. Your was an outstanding in terms of simplicity and explicitness of preparation steps. Thank you sooo much! Keep the good work and all he best! That makes me so happy to hear! Love the idea of adding feta too! Feta and squash go so well together – I’ll need to try that out next time. Thanks so much for taking the time to come back and let me know what you thought! Tried this last night and it was delicious! Thank you for the recipes inspiration! Thank you for coming back to let me know what you thought! So glad you liked it! Having some digestive issues, good to know that the FODMAP diet may not need to be permanent. Too many of the veggies on the no list are staples in our diet. Ha! You know – I wasn’t sure if I was just being weird by leaving on the skins whenever I roasted butternut squash until I saw an episode of Jamie Oliver where he said it was totally optional. Peeling squash is the WORST – thankfully they’re very much edible. I’m so glad you found my site! I hope you find it useful as you navigate through all the digestive issues – goodness know that can be a headache and a half trying to figure it all out.